Can you serve a cheese course as an appetizer? It depends: How much do you want to horrify your French guests? Americans serve cheese before the meal as an appetizer or hors d'oeuvres course. Here that is a huge faux pas. It is acceptable well before dinner, along with your aperitif drinks, to have a few small cubes of a cheese that is either hard or self-contained, generally skewered on toothpicks. For a lower-range apéro (as it's nicknamed), you can even put out (gasp! shock! horror!) processed cheese cubes wrapped in foil. But if you want to serve a real cheese course, with cheeses on a platter, served with bread, then it is always -- always -- served after the meal. That does not, however, make it dessert. In the olden days, it came after the fruit/dessert course, but now that desserts are heavier, sweeter, and less likely to be simply ripe and lovely fresh fruit, there is no doubt about the correct order: entrée, plat, fromage, dessert. Confusingly, the French word "entrée" does not mean what it means in English, where it describes the main meal. Here, the plat is the main meal, and the entrée is, as the name suggests, actually the entry into the meal. Also confusingly, French people serve salad along with the cheese course, after the meal, and never, ever as an entrée to the meal, though you can order a large goat-cheese-topped salad as your meal at many restaurants. For a less formal meal, you are certainly allowed to end after the cheese course. Lord knows I frequently do, seeing as how I am usually unable to resist until I completely fill myself up on the cheeses. It is even acceptable to have cheese as your meal, with a few caveats: you can have a cooked cheese meal, such as fondue or raclette. Or, you can have a casual cheese-and-bread meal with meats and vegetables alongside -- as I often do and to which I sometimes even invite French friends -- but just know that it's not actually very French of you. Apérobique -- also spelled Apérobic -- is a raw goat's milk cheese from Indre, in Burgundy. I know before I said that Bouton de Culotte may be the smallest cheese in the world. But clearly that is incorrect, because Apérobique lays claim to be the smallest cheese in the world -- goat or otherwise -- and I can hardly dispute it. Each one is about a third of the size of a Bouton de Culotte, or even smaller. 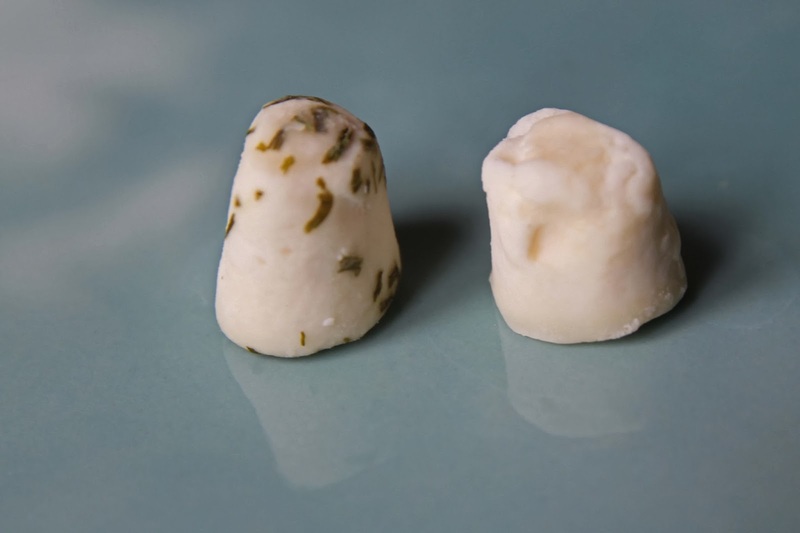 Apérobique is a tiny bell-shaped cheese that's got a diameter of 1.5cm at the widest part on the base, and weighs 3g. It's so tiny, it would get lost on a cheese platter, but it works well in a bowl, served with toothpicks. The name says it all: "apéro" is a common slang version of "aperitif", which is what we would call the hors d'oeuvres course -- the aperitif wines as well as the olives, crackers, or tiny cheeses. And a "bic" is a shortened version of "bicot" which is another word for "kid" (as in baby goat). The cheese is only made in the spring and summer. Interestingly, I've read information that says that , it's made with a mixture of goat and cow milk in the autumn, and with pure cow's milk in the winter; however, even in the winter, I've only ever seen the goat cheese version. It can be aged 2 weeks or more, and even can come ashed, and it ranges from mildly goaty to a slightly peppery kick. Either way, it's a delicious, tiny, bite-sized piece of creamy, savory goat cheese, plain or with scallion. Not enough to ruin your appetite for the courses to come. It's called Apérobique to highlight the fact that, as a very tiny, toothpickable cheese, it actually could be served for an apéritif. That's unusual enough that they need to really underline the point with both the size and the name. Trust me, 99% of the time, the French eat their cheese after the meal.